Watch this extreme winter sport that features a skier being pulled behind a horse while they dodge obstacles on the Canterbury racetrack! Looking for a unique, fun and thrilling family activity? Skijoring is coming back to Canterbury Park! So what, exactly, is skijoring? 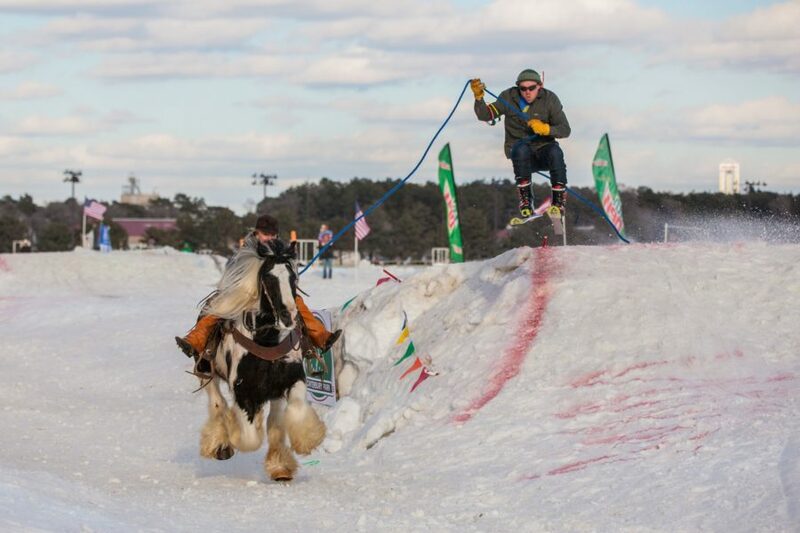 Skijoring is an adrenaline-packed race that involves a skier being pulled behind a horse! Competitors can reach speeds as fast as 40 mph as they maneuver through gates and other obstacles. Translating to “ski driving” in Norwegian, skijoring was first reported in the mountains of Central Asia thousands of years ago, according to Skijor International. It gained popularity in North America in the 1940s, and today is a competitive worldwide sport. Looking to compete for cash and prizes?